Every March, thousands of people working in the field of Seating and Wheeled Mobility come together for education, a chance to explore a massive and comprehensive exhibit area, networking, and catching up with old friends. The 2019 35th International Seating Symposium (ISS) in Pittsburgh did not disappoint, with over 2000 people from more than 35 countries in attendance. Missy Ball tries out the Seating Dynamics components while JJ Peek explains product features. I had the amazing opportunity to present a 4 hour pre-symposium workshop “Dynamic Seating – Exploring Theory, Research, and Products” with my friends and colleagues Jessica Presperin Pedersen, OTD, OTR/L, MBA, Jill Sparacio, OTR/L, ATP, ABDA, and Suzanne Eason, OT/L. 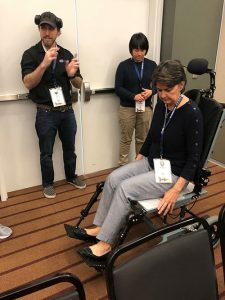 We concluded with a hands-on time featuring a wide variety of Dynamic Seating products, including the Seating Dynamics Dynamic Rocker Back interface, Dynamic Footrests and Dynamic Head Support Hardware. The participants were able to hop-in and try out each of these products. During the session, we also had many questions. The most common questions were about durability, followed by funding. I have written several blogs on the issue of durability that provide further information on this important issue. For clients who have often already caused damage to their seating and wheeled mobility equipment, durability of a Dynamic Seating component is critical. Seating Dynamics strives to design products that not only work well but are extremely durable. Seating Dynamics also has several resources to help with funding issues including Sample Medical Justification Wording and Sample Letters of Medical Necessity, all of which can be found under our Downloadable Information page. Later in the conference, I also presented on “3 Ways to Keep Your Client’s Head Up!” which included Dynamic options. This topic was of high interest with several hundred attendees. The session was recorded and we will post the recording under our Resources page just as soon as it is available for your reference. Head positioning is a challenging area of wheelchair seating and we explored many strategies that can optimize a client’s head position, as well as product features. Keep an eye out for a blog from Greg Peek on his ISS perspective “from the booth”! I so enjoy attending the International Seating Symposium each year and I love presenting with amazing clinicians like Jessica, Jill and Suzanne!